Yes I just spelled dear like deer in the title. I thought it kind of went with the post haha. You'll understand me once you read ahead. Okay so, I am a lover of anything that comes from Typo and when I spotted this little canvas sitting against the wall I just had to grab it. It's now made its way through my room, leaning against several walls and has finally made its place above my bed. I absolutely love it. With deer being one of my favourite animals I was drawn to it even more, I also love the simplicity of it with the pop of colour to the right making it eye catching. Well done Typo, and thank you to that kind person who picked it up, analysed it and put it back down giving me the opportunity to buy it, you're amazing haha. Hello all. I recently went to my best friend's 18th birthday party which was themed. Just an overall dress up idea, everyone came as whatever they pleased. I decided to create a costume of my own from different items rather then to buy a full costume. My choice in outfit ended up being very 70's/disco inspired. My first buy was this straight cut dress from boohoo.com that was only $20. 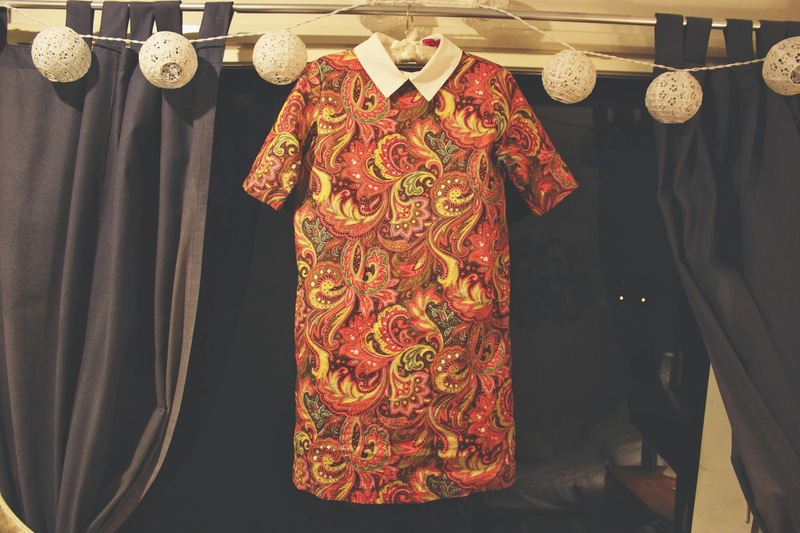 It was very vibrant, with a swirl/floral pattern that covered the entirety of the dress, excluding the collar which is white and if I do say, my favourite part. 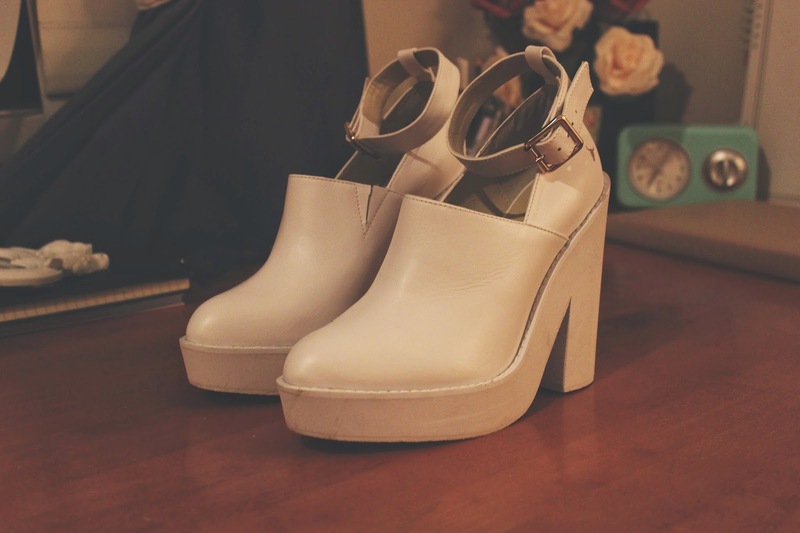 I paired the dress with these white platform shoes from Windsor Smith. They were originally $159 but I managed to grab them for only $25! in an outlet store, YAY. I thought that the shoes were very disco like with the platform and chunky heel and the gold buckle added a little bit of class which I loved. 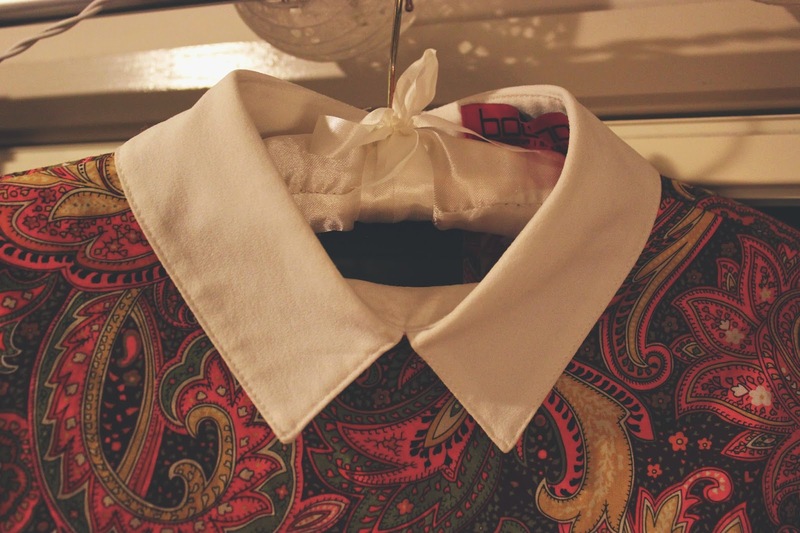 It also matched the white collar of the dress. I didn't wear any other accessories as I like simplicity however I did wear a bold eyeliner look as that was very popular in this era. 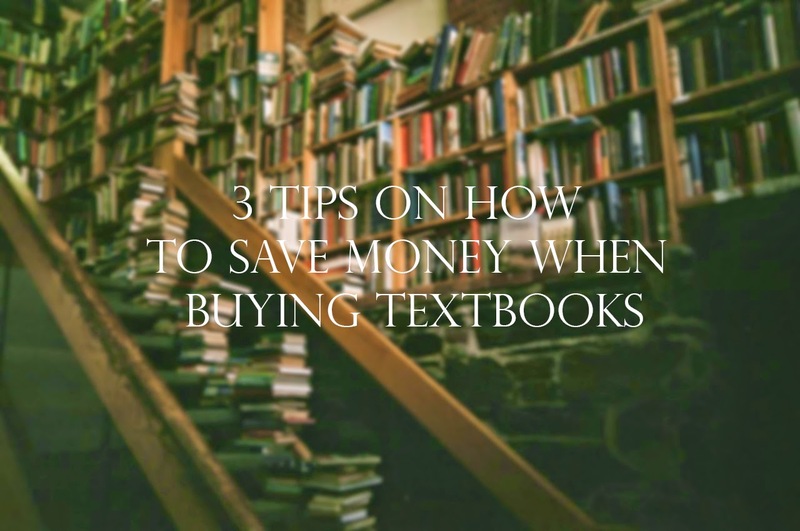 There is absolutely no point in spending a lot of money on a textbook to find that you don't use it or you are only required to read maybe, one section or even just a few pages. I found that it's best to read up on your particular course. See if it states if the entire book is required or only a few pages. I also visited my university bookshop and asked one of the staff for assistance and she advised me on exactly what books were requested from my lecturers. This will certainly save you some dollars. One of the most simple approaches you can take is to search the internet for the specific book you are looking for. Suss out the prices and see what the average amount the book is selling for so you have an understanding of how much money is being asked of you. Then see if you can find a copy selling for cheaper, try sites like ebay and Amazon or websites with free postage to lessen the expense. This is my NUMBER ONE. Thousands of students have most likely previously completed your course and they are all selling their used textbooks. You really don't need a brand new, shiny textbook because realistically, you're going to slave over it and never use it again once the semester or year is over. So who cares if some of the pages are showing signs of usages or there is damaging to the binding. Nobody will judge. Students are selling their books for so cheap! A lot of my books were marked around the $60 - $100 mark and I got them between $50 and $20. It's as simple as that. University is expensive, there is no getting around it but there are ways to save and lessen the cost of some expenses. See if these quick tips help you in the future. I am a big reader, it is a passion of mine along with others. I'm studying a Screen Studies and Creative Writing/Literary Studies course at university so you'd want to hope that I like to read haha. I've discovered a lot of different novels and texts from all different genres that I love however I'd like to mention one that I happen to find very interesting and entrancing. 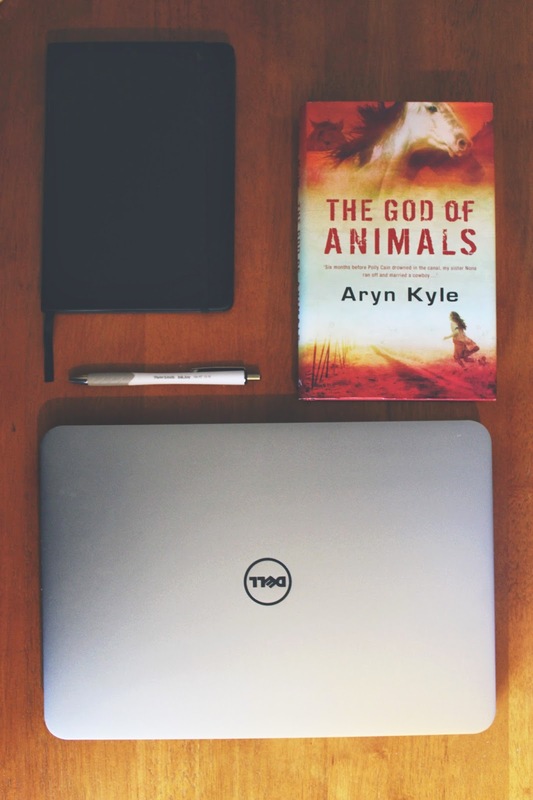 This novel isn't for everyone, it doesn't follow the popular supernatural aspects that are very entwined in a lot of novels today. It is very realistic and lifelike, which is what captures my attention. I don't read many novels that actually move a person, this one did exactly that. 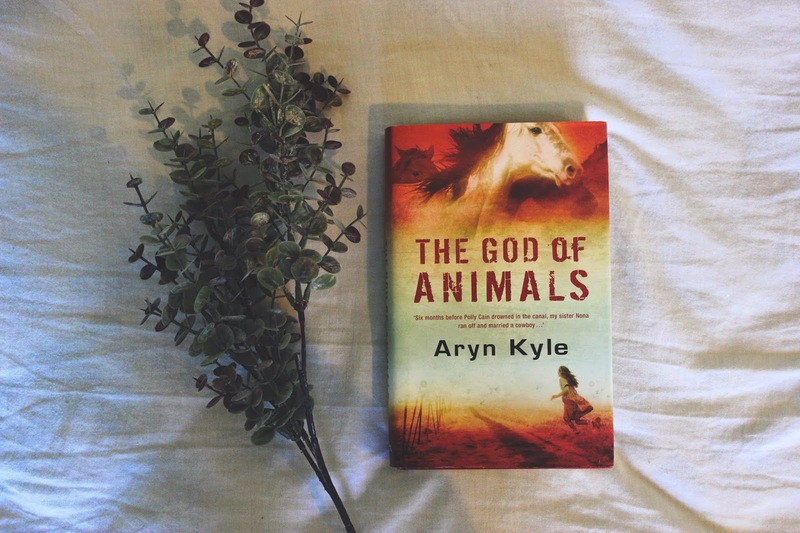 The God of Animals by Aryn Kyle, 2007. Before I delve into the details of why I recommend this novel here is a short snippet from the back cover of the book. 'Alice Winston is twelve years old, and her world had turned upside down. After her older sister elopes with a rodeo cowboy, Alice is left to bear the brunt of her family's troubles - her melancholy and bedridden mother, her reticent, overworked father, and their run-down horse ranch in desert Valley, Colorado. Facing the hottest summer in fifteen years, Alice and her father breed their horses, give riding lessons and , as the pile of bills stacks up, lower their heads and agree to board the pampered horses of their rich neighbors. For Alice, it is a social education, bringing her into contact with a new breed of woman, and teaching her that for both horses and people, it is bloodlines that make all the difference. As the dusty, stifling summer unfolds, Alice's family and their well-being become intertwined with the lives of their clients; her father pins his hopes on a gorgeous but unbreakable horse and Alice, left too much to her own devices and obsesses with a girl who drowned in the canal, begins a dangerous friendship. Night time is my favourite time. I love the simplicity of it, the peacefulness and space. It allows me to open my mind and think without bother, without interruption and without annoyance. I for one am not a morning person by far and so I know for a fact that I would much rather spend hours within the night being productive than in the early light of the morning. Living in a house with younger siblings it is also my time to be alone without a little 8 year old barging into my room with a million questions. This is also the time in my day where I feel most creative. Then is when I think of photo ideas, projects to complete, stories to write and things within my personal life. It's peaceful. 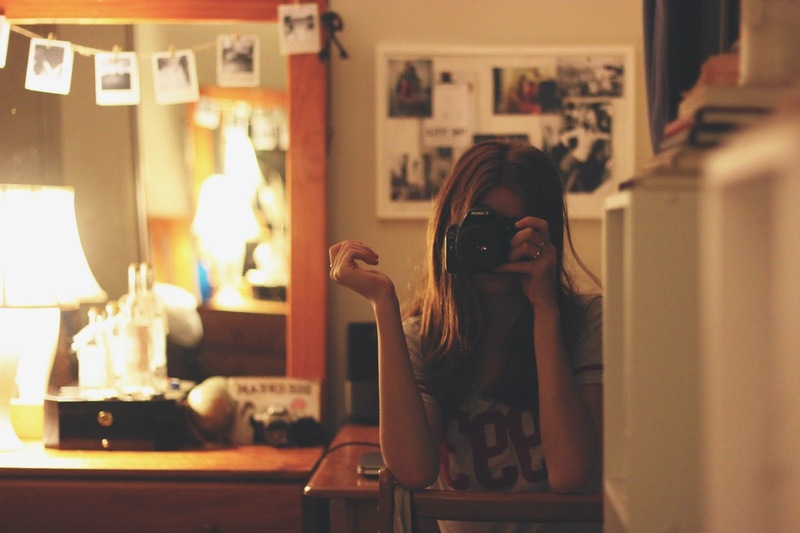 As you can see from the photograph above, I happen to always find that within the depths of the night my camera and mirror become my best friend. Also my window, as it creates a canvas of reflection to shoot in front of. Not pointing at assumptions that I'm 'vain' but rather appreciative. Regardless of the fact that I'm just sitting in my pajamas pointing a camera at a mirror and posing, I still feel a sense of creativeness. 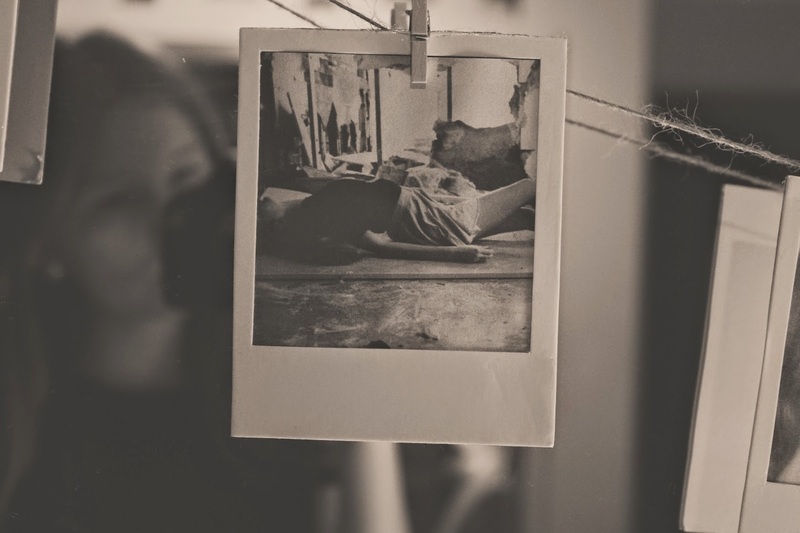 In my mind I'm thinking of camera settings, which lights should be on or off to create the best effect, the surroundings and what position to place my body in to create an image rather than a picture. That is simply my opinion though, a lot of artists would disagree. Nevertheless I find fun in it. I like to be creative even if its just taking a 'selfie' or a proper photograph like the one below. When taking this image I was envisioning the outcome, I wanted to embrace the human body and thoughts of the word 'naked' in a polite and sensitive way. This was a shoot for a project that I thoroughly enjoyed doing. I'd like to someday turn this photograph into some form of writing to express my opinion on photography even further. Overall though I had the same creative thoughts going on in my head in the middle of the night when I took that self portrait to the middle of the day, in the rain, shooting in a forest with my best friend. The content of a photograph doesn't represent the amount of skill and creativeness used to produce it, it just defines the type of skill and creativeness - in my opinion. Now I wouldn't say I am a great or a professional photographer at all, I would label myself more as a creative enthusiast or something along the lines haha. I use photography as a way to create and I embrace that thought. Yes it does take a lot of skill to shoot beautifully and I look up to those who can shoot far better then I can, yet it is a learning process and I am learning. Like a lot of you out there are. Just embrace it. Spend hours in the night thinking, or wake up at the crack of dawn. Take a photo. Capture life. ENJOY. Yes I know it's already a few days into February but I thought I'd still talk about some of my favourite items I had throughout last month. This is a collection of random items, makeup and skincare that I have been absolutely loving recently! I do change what I like quite regularly so this may become an often post. Some of these items though I have actually had for a while and after they slowly found their way into the back of my cupboard I have recently brought them back out and I instantly fell back in love. 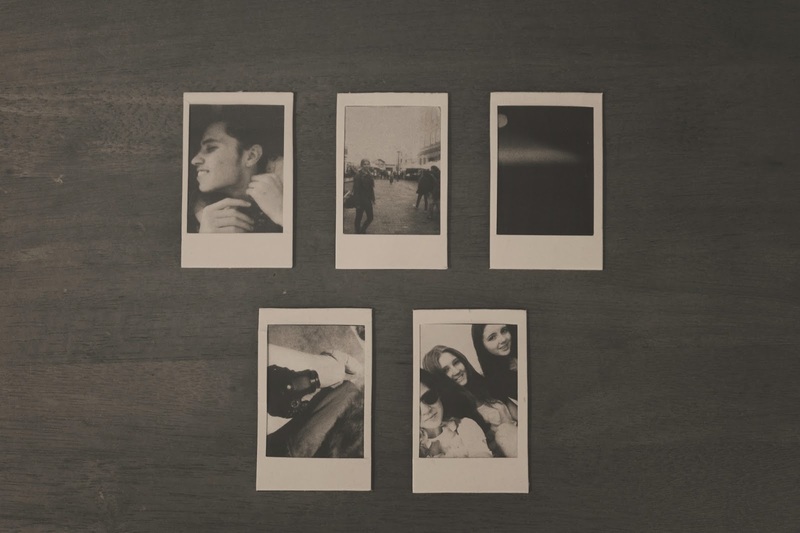 One item or well 'items' that I have been loving are these little homemade polaroids (as seen below). I made these myself from a stencil that I bought from Kmart. It came in a pack of 12, with 6 small and 6 large stencils and only cost $2 - gotta love Kmart. 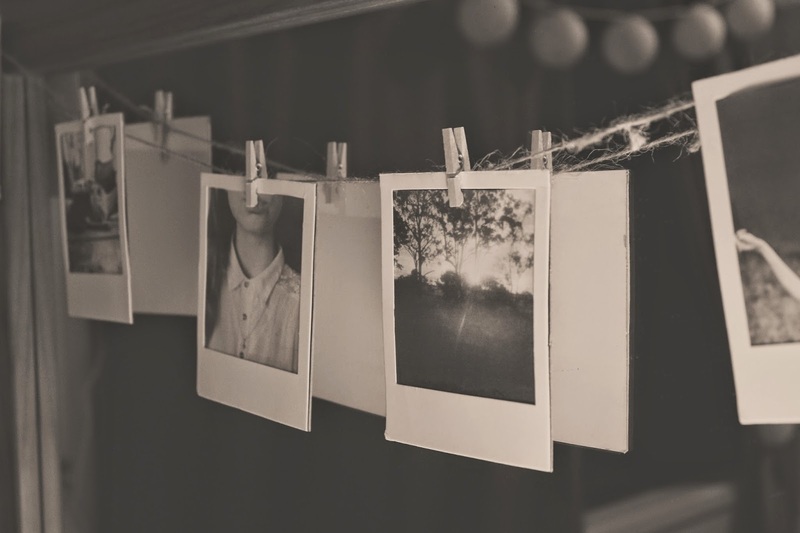 I have the large pictures hanging up across my dressing table and the smaller ones sit on top of a set of notebooks on my desk. In terms of skincare I have been ABSOLUTELY loving (like so much) this face moisturiser from Simple. This was a recent discovery of mine and I just love it. 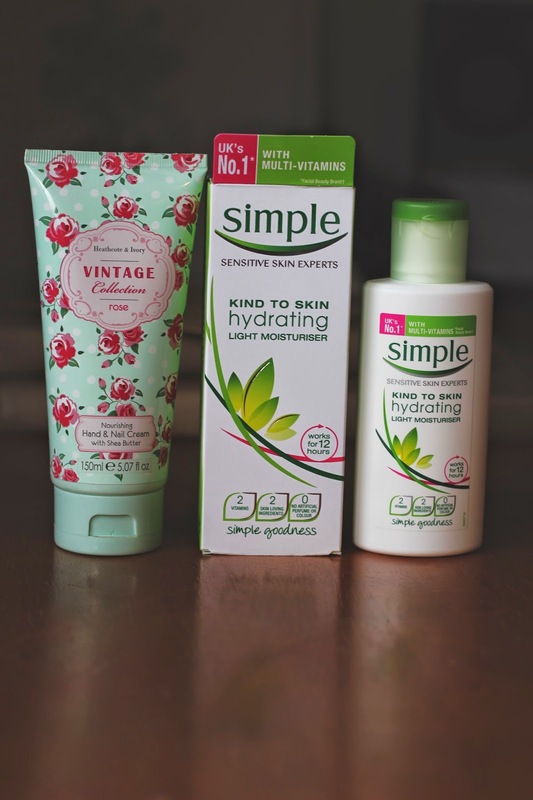 This moisturiser leaves my skin feeling fresh and clean and also works well under my foundation. I have been using it along side a facial wash from the same brand and my skin has been the best it has ever been. I've also noticed that my face looks and feels smoother, I highly recommend this product. I have also been loving this hand cream by Heathcote & Ivory. 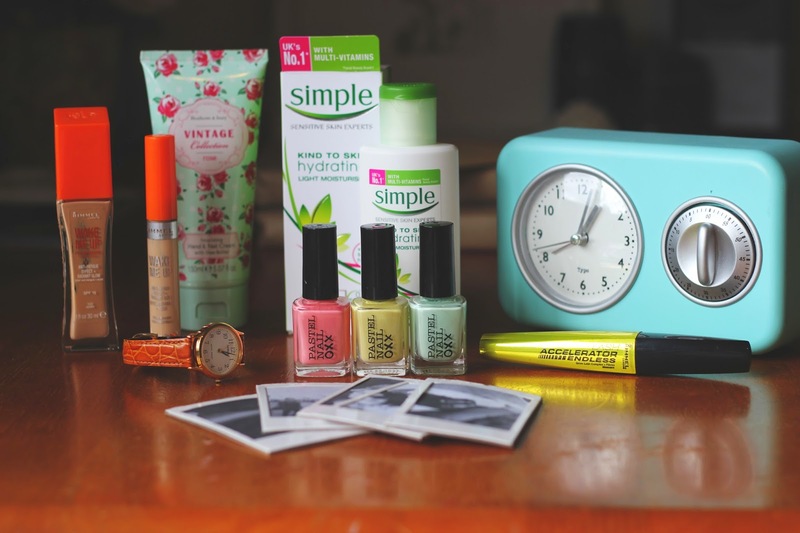 It is their 'Vintage Collection, Rose, Nourishing Hand and Nail Cream with Shea Butter'. Now I don't use a hand cream ever, really, but this was brought for me and I cannot describe to you how amazing this smells! That's mostly the only reason why I love it haha. Onto the makeup now. I have had this foundation for quite a while and I have loved it the entire time. 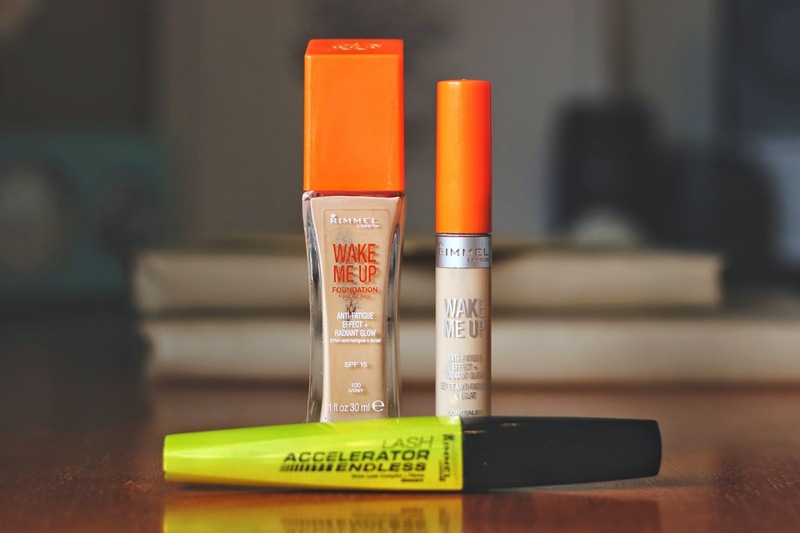 Rimmel's Wake Me Up foundation and also their concealer. Love, love, love. Now this foundation wont be to everyone's taste. It's very vibrant and a little bit sparkly, I happen to like that though as my skin looks quite dull in its natural state and this foundation does exactly as it is named, it gives me the allusion of being more awake haha. The concealer is a love of mine as it is very good for highlighting under the eyes and covers those unwanted dark circles quite well. I have been using these to products in conjunction with this mascara, also from Rimmel. Their Lash Accelerator Endless, in dark brown. This just happens to be a mascara that I like at the moment, no particular reason (wow so descriptive haha). Accessory wise I have fallen in love with this watch from Lorus. It is exactly what I like when it comes to my taste in fashion. I have been wearing it constantly and by constantly I mean almost everyday haha. 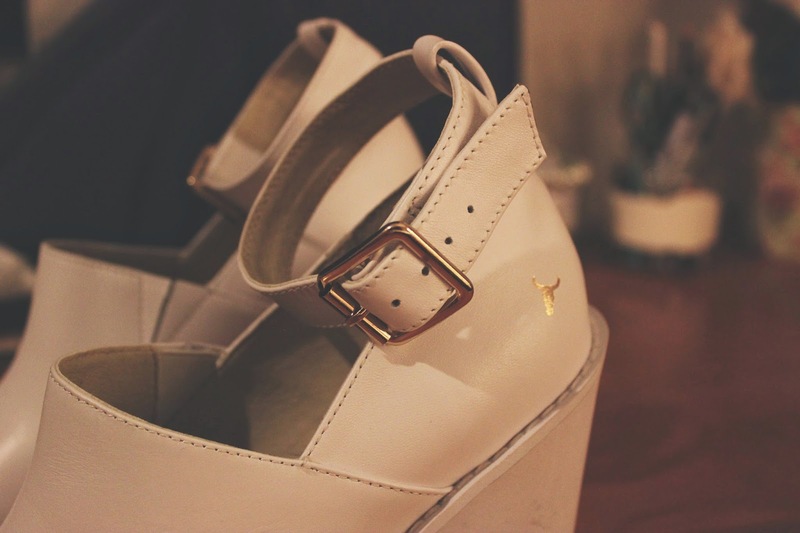 It matches with a lot of the clothing/shoes I wear as I am a lover of the tans and browns. I like that it has the leather look band and the gold rimed face, I find it very classy yet laid back at the same time which I look for a lot. 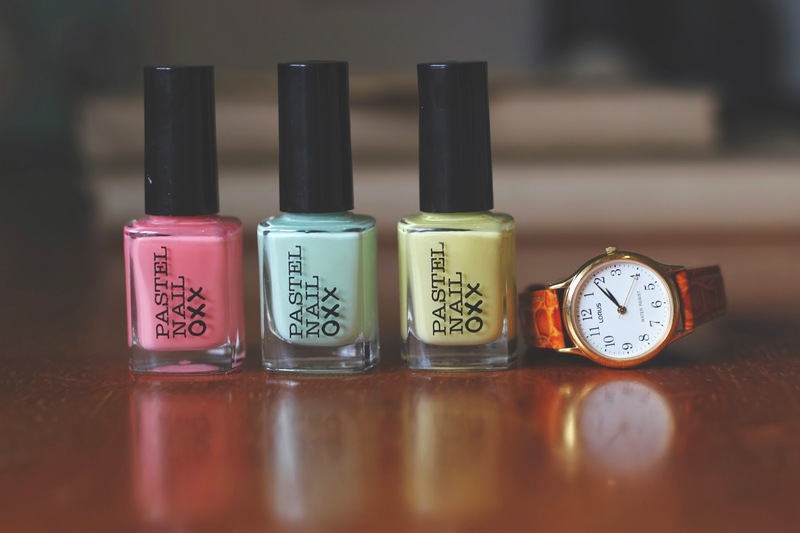 Another accessory, or well not accessory are these pastel nail polishes from OXX. These are not the best polishes when it comes to quality but I love the colours. As it is still summer here in Australia these colours are a statement and I have been wearing them all holidays. They are also EXTREAMLY cheap which probably explains the poor quality, however that doesn't bother me too much. They were only $2 each from Kmart. 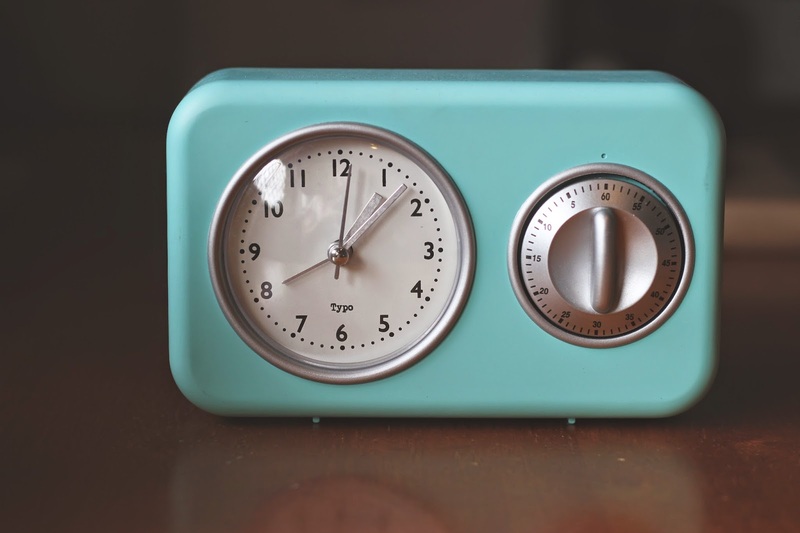 Finally my all time favourite from this month by far is this baby blue clock/timer from Typo. Oh my I do love this. I don't actual use it to read the time or time anything haha. 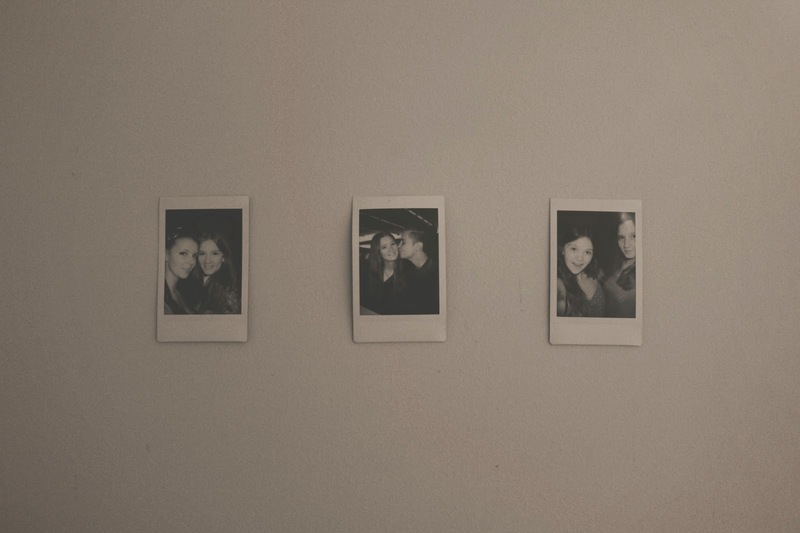 It is used as decoration for my desk and it looks so lovely against the other decor in my room. 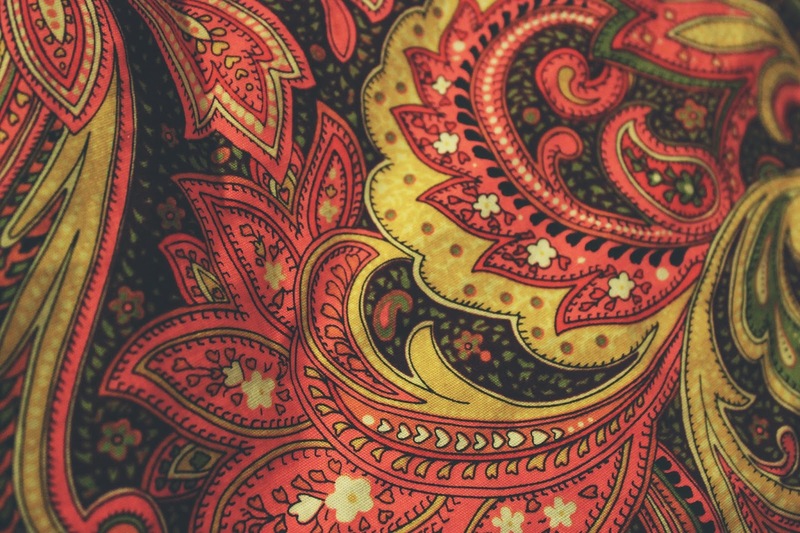 This grabbed my eye for one the colour and two the vintage yet still modern look. It is definitely a feature on my desk and I don't think I'll be getting rid of it very soon. 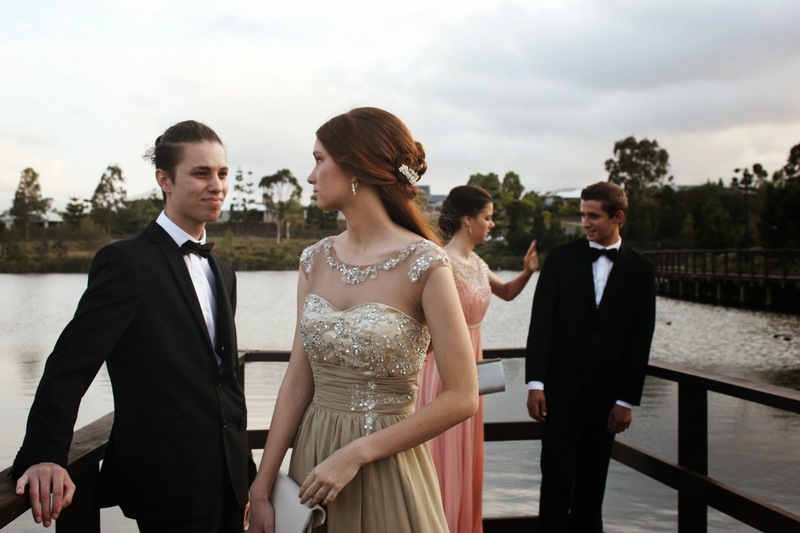 Nearly almost every year twelve student is excited for the formal the first day they start the new year. I happened to be one of them. On our very first assembly the teachers were like "yes we can talk about the formal in a minute" haha. I spent hours exploring the internet, looking for the perfect dress, hairstyle and makeup look. I was very fussy though and changed my mind constantly. 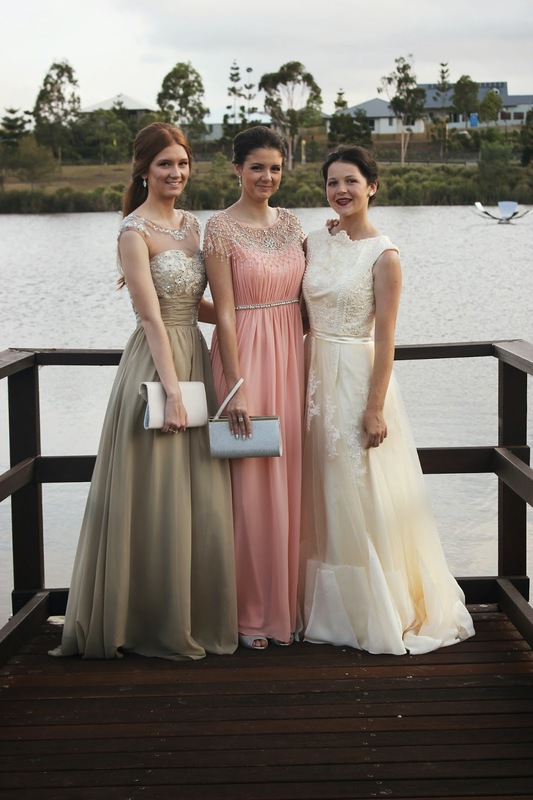 My formal has now been and gone and it's nice to look back on the memories of that day/night. The whole thing certainly went faster then I thought and to be honest, spending so much time thinking about it throughout the year was probably a little bit of a waste of my time but I still thoroughly enjoyed the experience I did the very risky thing of buying my dress online though. Ahh. It was made in China but brought and sourced from an Australian online store which made the experience a little less daunting. However, in saying that, the dress came in the wrong colour but perfect fit. In the end the colour of the dress didn't bother me too much as I still looked damn good haha (joke implied). In all honesty though I would have preferred to have tried on and brought a dress in store. Don't even get me started on the prices of some in store formal dresses though. Geez. The night itself was very unexpected and lovely. The arrivals were AMAZING. I arrived with my date, best friend and her date. Our formal committee had decided on a 1920's theme that looked very stylish. The tables were covered in a black table cloth with black draped chairs and gold decorations. There was a dance floor that our cohort most certainly took advantage of and I happened to notice that when the DJ played Taylor Swift - Shake it Off, everyone got up and danced haha. We continued to dance the entire night away and sadly I even managed to rip the bottom of my dress :( not that i'll ever wear it again though. Then came the after party which to my opinion was a little disappointing but it wasn't the whole point of the night. Overall I think that it is an experience that every graduating high school student should experience. Yes it can be very expensive but if you shop as if you're on a budget then things will become cheaper in my opinion haha. Maybe see if there is someone who could do your hair or makeup for cheap or maybe even free if you're super lucky, like myself. My mother did my hair as she is a hairdresser and my friend did my makeup as she is a studying beauty student in return for my mum doing her hair. It was very magical and a fantastic may to end the year with all of my friends. 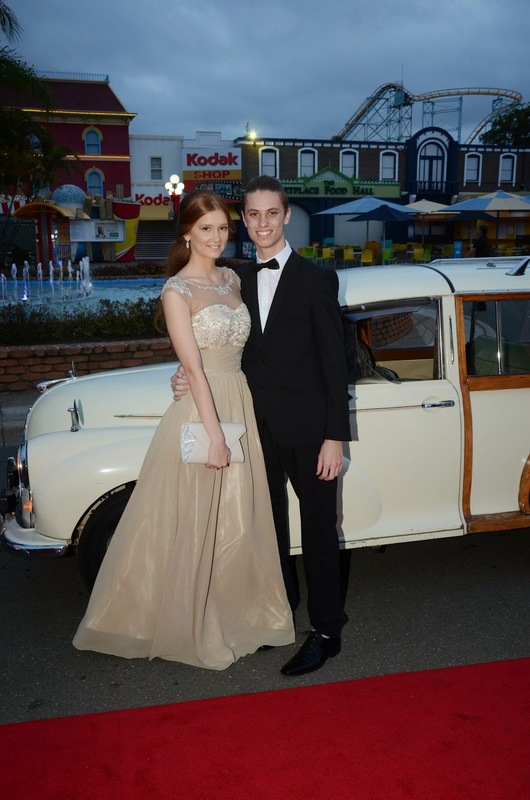 However that was over 2 months ago, its just nice to sit back and write about my experience and share it with you all :) Let me know how your own formal went, even if it was years ago or in 2014 like myself, I'd love to know.